Coming in a close second in Overall Score in our study, the Zeiss FL 8x32 provides stunningly bright images, no discernible chromatic aberration, and superior (4.8) resolving power. 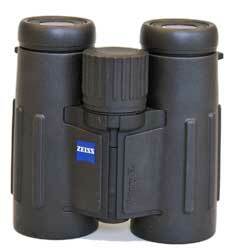 The Zeiss FL is exceptionally compact and could tuck in a purse or large pocket. Its shape and armoring make it wonderfully comfortable to hold. We think it's the way the barrels bow out to fit the hollow of the hand. A perfect score of 5.0 in fit & feel! The FL's focus knob has perfect balance between firmness and ease of turning. It's precise and consistent throughout its range. The diopter adjustment, on the focus knob, is simple and efficient, with an ideal degree of resistance. It also got a 5.0. All agreed the FL worked great with glasses. Pro: Superlative optical quality; 420-foot field of view; compact and with outstanding ergonomics; unsurpassed focus knob; works well with glasses.